Edward Barber was born in Tring in 1893 and was the son of a lamp lighter. 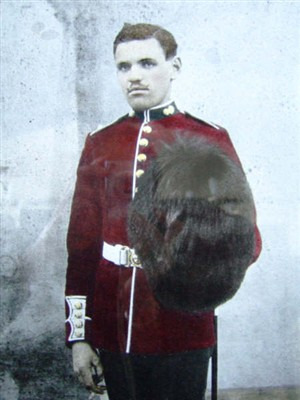 Barber won his VC at the battle of Neuve Chapelle on 12th March 1915. He ran ahead of his grenade company throwing bombs at the enemy. Many of them surrendered and by the time the grenade party caught up with Barber they found him alone, surrounded by surrendered Germans. Barber was officially reported missing on 14th March. In 1965 Barber’s Walk in Tring was named in his honour and a portrait of Barber hangs in Tring council offices.